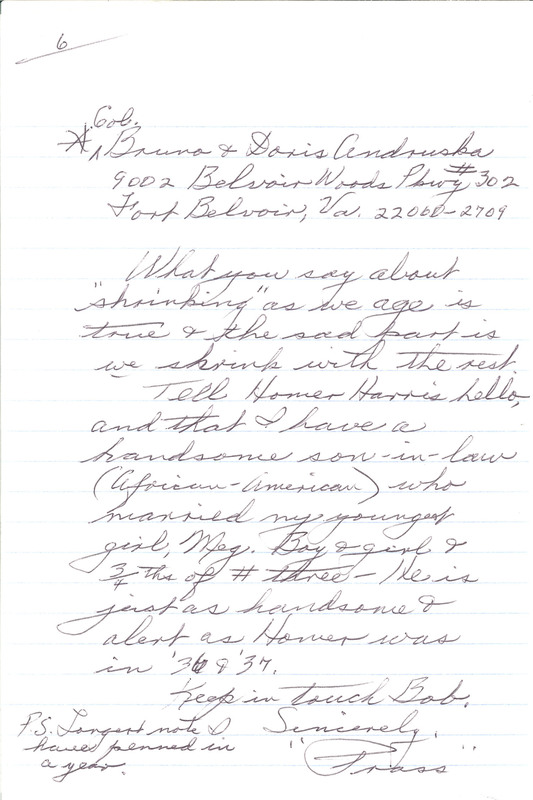 Col. Bruno & Doris Andruska 9002 Belvoir Woods Pkwy #302 Fort Belvoir, Va. 22060-2709 What you say about "shrinking" as we age is true & the sad part is we shrink with the rest. Tell Homer Harris hello, and that I have a handsome son-in-law (African-American) who married my youngest girl, Meg. Boy & girl & 3/4ths of #three - He is just as handsome & alert as Homer was in '36 & '37. Keep in touch Bob, P.S. Longest not I have penned in a year. Sincerely, "Prass"